As I anxiously anticipate the arrival of my second daughter, I can’t help but think of my own childhood and the great men that were in my own life. There were plenty of ups and downs in my young life, but my late grandfather was a person who always made me feel special. I consider myself lucky to have had grandparents that were not only a positive influence, but who also lived less than ten minutes away for a large part of my life. My grandfather (AKA Pop Pop) was a loving and proud man. After serving in WWII with the Army, he worked for Ford Motor Company for over 40 years until his retirement. Ladies of all ages always seemed attracted to his quick wit and he certainly didn’t mind the attention. He loved my grandmother dearly and in all the time I knew him, he was always positive and never complained, even when he was at death’s door. When I was a child, my dad and grandfather would take me on what we called “secret trips” one Saturday each month. No women were allowed, and since it was a secret, I wasn’t supposed to tell my mom what we did (although she always found out). Some days it would be a fishing trip at the Jersey shore, a visit to a car show, and if the weather was agreeable, we’d find our way to the horse track or a sports game. Regardless of the weekend trip, they all started with a big breakfast before the sun was up, a stop at a local sub shop for lunch, and a big dinner. On the days we went fishing or to the horse track, we’d end our day at a small seafood shack that overlooked the Jersey Shore. It was small, dirty, and filled with fisherman and locals. I loved this place. When I was there, I felt like an equal with my dad and granddad. 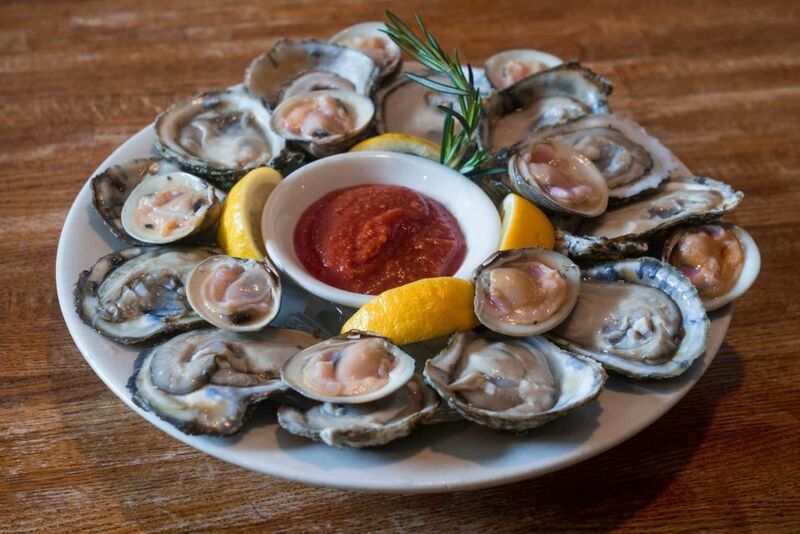 We’d all order and eat the same thing- dozens of raw clams on the half shell. Even at the tender age of 8, I knew how to properly eat them. I’d confidently grab a clam and dress it with a small spoonful of cocktail sauce and splash of lemon. Each clam would be topped it off with a single a drop of Tabasco sauce before I happily slurped them down like a seasoned pro. That briny goodness was a true flavor explosion in my growing and underdeveloped palate. Many years have passed since I’ve last shared a meal with my dad and Pop Pop, but every time a raw clam hits my mouth, it still takes me back to a time that was full of adventure and happy memories. Pop Pop, you are missed.